A year ago today we were on a safari in Kruger National Park in South Africa, and definitely having more fun than I'm having today at home. So naturally, I'm reminiscing and looking through our pictures. Here are 30 of my favorite photos from our four days in Kruger when we visited in January. 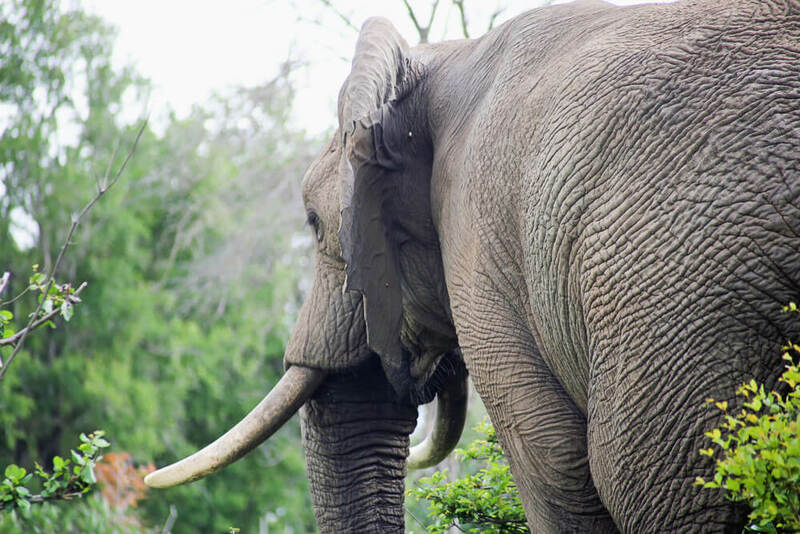 There are so many things to choose from in South Africa (just check out this inspiration worthy South African bucket list), but safari was the absolute best part of our trip. UPDATE | We realized how much we love South Africa and have returned for a second trip since this post was published. We went back to Kruger, spending 5 nights inside the park at rest camps. Read about that trip here. I mainly wanted to do self-drive safaris to explore on our own. But knowing we would be jet-lagged that first morning, I did schedule one guided game drive with our hotel. It was nice to not have to do anything but relax and take photos. It was also a great introduction to the park and the guides offer a wealth of information. But nothing compared to the self-drives we did. We'd pick a different area of the map every day and explore. We saw just as many animals on our own as with a guide. You'll love your experience with either choice! 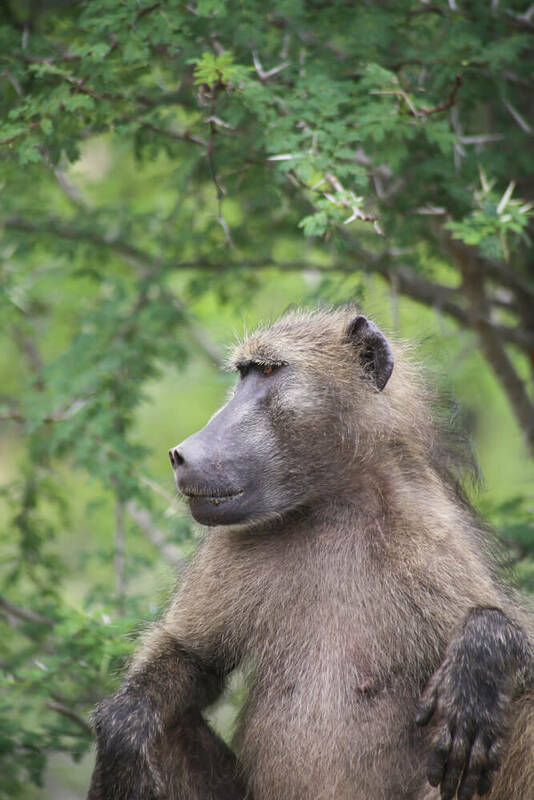 On our first morning, we watched a troupe of baboons eat fresh amarula for breakfast, straight from the tree. One massive baboon is asleep in the tree with his back to us (where's Waldo?). The adolescents climbed the tree to enjoy their fruit. We saw all of the Big 5 on our trip. 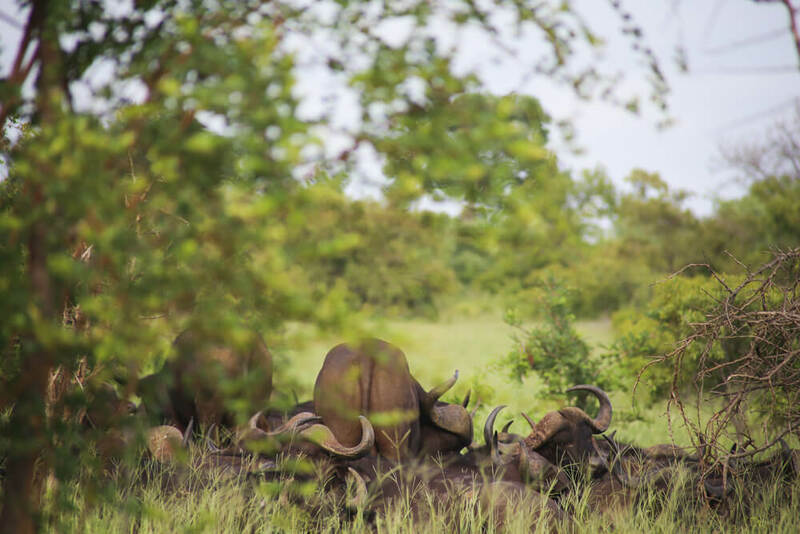 The Big 5 are Lion, Leopard, African Cape Buffalo, Elephant, and Rhino. The name refers to the five most difficult and dangerous animals to hunt on foot. We just hunted with our camera. You should also keep your eyes on the sky. 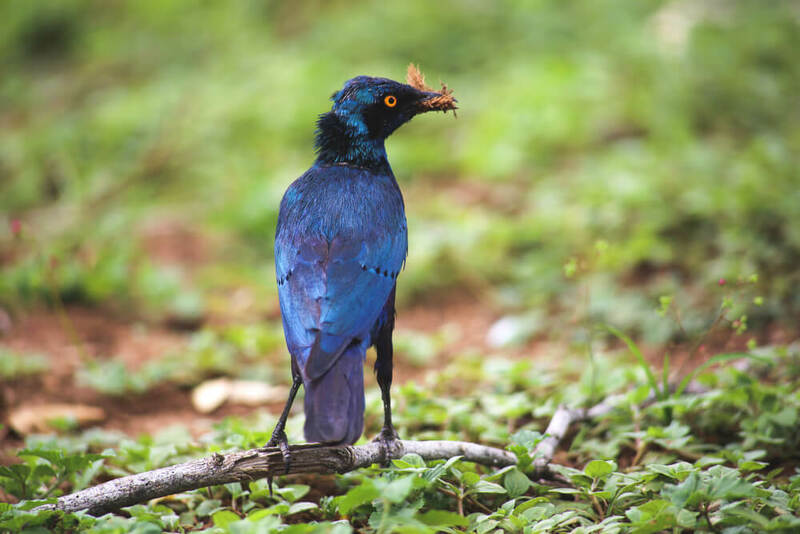 The birdwatching is incredible in Kruger. Just check out that lilac breasted roller up there, he's more colorful than an easter egg! For our most exciting 60 minutes of the trip, we started with a day of self-driving without much action. 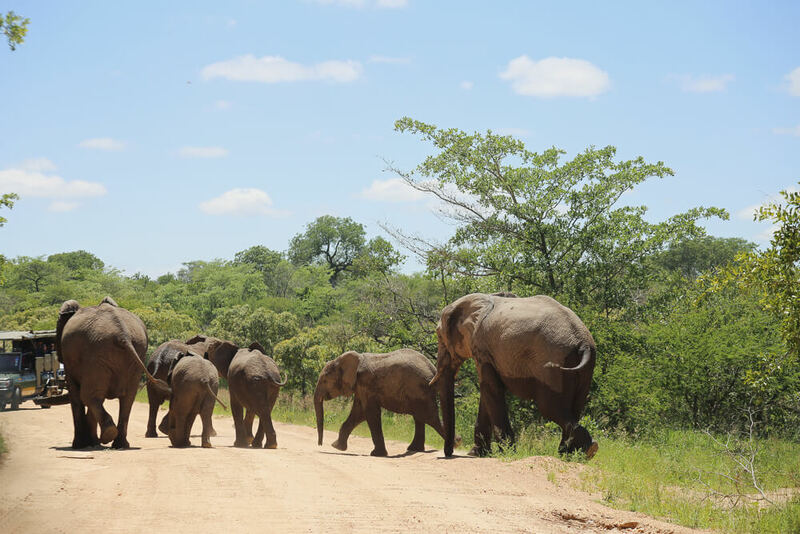 Then bursting out of the thick green bush, this parade of elephants crossed the road just meters in front of our car! Then one of the guides gave us directions to find lions asleep nearby. After watching them sleep and yawn for a while, we left and turned the corner to come face to face with a giraffe. He seemed to be looking us right in the eye, before crossing the road in front of our car. This hour was definitely filled with our best wildlife encounters in South Africa. If I could give you one piece of advice, and one piece of advice only, it would be this: BRING BINOCULARS. See all the details on that elephant up there? That was captured with a 300 mm lens. That's not even THAT big of a zoom in the realm of telephoto lenses, but it still got me a much better view than the naked eye. Our binoculars did even better than that. With our binoculars we could see the wirey hairs on his leathery skin. We could see smaller animals that were far away as if they were next to us. We could see the very minute details of animals that were already close. I know what you're thinking, "um, I know what binoculars do idiot, I don't need this explanation." I'm only trying to hammer the point home. Just bring them, and thank me later. Most guides seemed uninterested in the impalas. They're very prevalent in the park, so it's true that they aren't the most exciting find (they're everywhere). But I still loved watching them. They were so graceful and I enjoyed watching them interact. I particularly loved this one that wasn't bothered at all by the Red-Billed Oxpecker hopping all over his face. The birds groom them and clean them of flies, parasites, and ticks. Wide open spaces are great places to find giraffe, zebra, and wildebeest. These three more timid species tend to hang together, alerting each other to predators. We visited in January, in the midst of summer. The heat was bearable during the afternoon, and the mornings and evenings were cool enough to need a light jacket. The biggest downside is the grass is high and the trees and bush are full. This makes it harder to spot game but I really didn't think it was too difficult. We saw a lot and I loved the park this way, so lush and green. I believe winter months are more recommended just for this reason. We'll just have to return in winter to compare and contrast, I wouldn't complain! We came across this lone baboon just hanging out on one of the mile markers on the side of the road. He couldn't have cared less about all the cars stopping to gawk at him. Don't forget the rivers! Along one of the rivers, there were lots of driveway-like paths that bring the car close to the edge of the embankment. We pulled over, turned the car off and waited. But it wasn't long before we saw these 4 hippos swimming along. Give yourself time to look, they'd be nearly impossible to spot if you're in a moving vehicle. Fun fact: antelope have the ability to shut up shop in the reproductive department in harsh conditions. The females just won't get pregnant. That's not a scientific explanation but it's all I got. South Africa is in the throes of a horrible drought and there aren't many baby antelope at all in the parks. But we did get lucky and got to see this little guy crossing the street with his mom. On our last day, we were in the park at 5:30, right when the gates opened. We were driving to Swaziland (read about that here) but wanted to enjoy one last morning of wildlife on the way. We got lucky and saw 3 hyenas within minutes of entering the park. Hyenas are nocturnal so I was sure we weren't going to get to see any. A huge bonus to end the trip with!! This last animal sighting we were blessed with before we left the park was a huge troupe of baboons just hanging out on the road. They were quite the roadblock! We couldn't get through them, but that's ok because we didn't want to. We just pulled up and watched. This mama spent at least 10 minutes picking fleas off her baby before they joined back up with dad (who looked like he's been through a fight or two). Disclaimer: I'm not a professional photographer. I'm a hobbyist (is that a word?). So you don't have to be a professional photojournalist to get fantastic photos on your safari! But I do recommend that you invest in a camera besides your smartphone for this particular trip. I used a Canon 6D and a 70-300 mm telephoto lens for all of the pictures I posted here. The Canon Rebel line of DLSR's are also fantastic cameras and very beginner friendly (both in price and in ease of use). I only recently upgraded to the 6D from my Rebel after 6 years with it. If you have the opportunity to go on a safari in Kruger, don't question it! It's an affordable way to see some amazing wildlife!! !